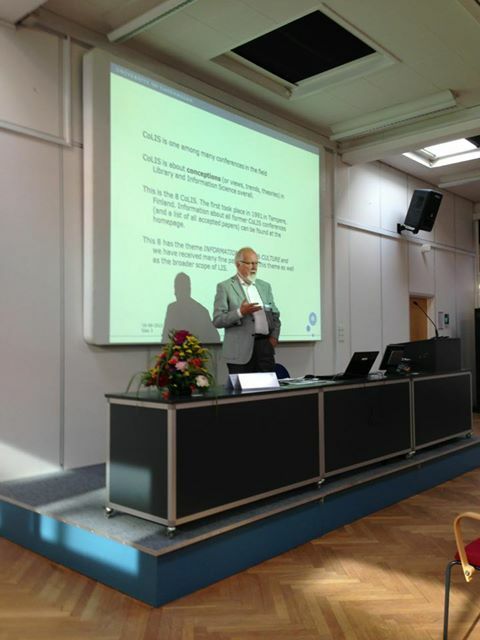 The eight in the series of CoLIS (Conceptions of Library and Information Science) conferences was held this month in Copenhagen. The splendidly efficient organization was provided by the Royal School of Librarianship and Information Science, the Danish iSchool, now being incorporated into the University of Copenhagen’s Arts faculty. As always with CoLIS, the topics covered were very varied, with an emphasis on theoretical and conceptual issues; this continues to make CoLIS a unique forum in the library/information science (LIS) area. This time there was an increased focus on cultural heritage, practice theory and humanities perspectives, although information literacy and knowledge organization were also well represented. It will be interesting to see if this move to a cultural paradigm is continued in future CoLIS meetings, though not, it is to be hoped, at the expense of other themes and perspectives. For me, the highpoint of the conference was the panel discussion on the philosophy of information, and Luciano Floridi’s contribution in particular, a wide-ranging examination of epistemological and ethical issues around information in an age of ‘hyper-history’. Following pre-history, in which there were no information and communication technologies (ICTs), and the age of history in which society uses ICTs from the advent from writing to the late twentieth century, a hyper-historical society is entirely reliant on ICTs. I also very much liked Floridi’s concept, appropriate to the conference location on one of the many islands of which much of Denmark is composed, of the idea of information as an archipelago, with various answers to the question “what is information’ relating to the different islands. Having said that, I admit to feeling most comfortable with Birger Hjørland’s reiteration that LIS is primarily concerned with information instantiated in documents, with that term understood very widely. There papers, together with a variety of other perspectives on the nature of information will appear later this year in an issue of Cybernetics and human knowing. In a new departure for CoLIS, and indeed any other information conference I have attended, Theresa Anderson built on her studies of the value of ‘pausing’ and ‘playing’ in complex, pressurized information environments, to offer a space for, among other things, guided meditation and the composing of Zen poetry. The full proceedings may be found here, and papers from them will appear in September in Information Research. My own paper, jointly written with Lyn Robinson, on the ways in which information can be considered physical, and why this might matter for LIS, can be found here. Isto Huvila has written reports of aspects of CoLIS on his blog, and other thoughts and musings on the conference can be found on Twitter, with the hashtags #colis8 and #colis2013. The next Colis conference will be held in June 2016 in Uppsalla, Sweden, organized jointly by the Departments of Archive, Library and Museum Studies at Uppsala and Lund Universities. Updates will be on Twitter, with hashtag colis2016. Next Post As long as we don’t pretend that it is science?